How to choose the right yardstick to evaluate active management strategies. Recently I joined a carpool to cut my commuting costs. So far, it has worked out great, but the friend I am travelling with, Jason, is a bit cocky about his skills of getting me to my destination faster than ever. Could that really be possible—and if so, how does he do it? I need to find out. While the context is obviously different, as a trading strategy consultant, the situation described above is actually similar to what clients ask me to do on a regular basis. Just as Jason claims to have abilities that set him apart from regular drivers, my clients want to know if a specific active trading strategy offers them an edge. One of the methods to help answer this question is to apply benchmarking. How it works and what considerations go into the process can be explained by our little story. Benchmarking is all about making comparisons and, by doing so, putting results (driving skills, financial performance, etc.) into perspective. The trick is to select a yardstick that allows you to draw valid conclusions so that you don’t compare apples with oranges. Let’s go through a step-by-step process on how to get there. Typically we start out with a baseline, an already meaningful yet usually quite broad measure. Coming back to our story, this is simply the average time my commute took in the past. As I have the habit of always leaving at 8 a.m. sharp, I just needed to check the arrival times on my punch card to see that it took me, on average, 53 minutes to get to work. A typical baseline for evaluating the active management of equities is a broad index like the S&P 500. To keep things simple, we will use compound annual return (CAR) as our performance measure instead of more complicated, but preferable, risk-adjusted metrics. We will calculate it with price data from the exchange-traded fund (ETF) “SPY” that shadows the S&P 500 and can actually be traded, versus the index itself. Applying a buy-and-hold approach over an eight-year period, we get a value of 6.1% as our baseline. Over the last several weeks, when Jason was driving me to work, it took only 29 minutes—much less than the 53-minute baseline. But is this really a fair comparison? After all, I used my 20-year-old station wagon, whereas Jason has a high-performance car. This has to account for something, right? So for the next few days, he let me take the wheel—and guess what? My driving time was reduced from 53 to 48 minutes … all through the wonders of modern technology. The trick is to select a benchmark that allows you to draw valid conclusions so that you don’t compare apples with oranges. Similarly, for the evaluation of a trading strategy, we also want to adjust for the difference in vehicles. For the baseline, we looked at SPY, but the strategy we are interested in will be run on a specific set of ETFs that each covers a different sector of the equities market. This allows for a more precise allocation of funds than just investing into the broad index. Therefore, we want to adjust our benchmark to account for that advantage and replace SPY with the identical sector ETFs that the strategy uses. We call this the “Passive Portfolio Benchmark,” as we altered the portfolio but still trade it passively (buy and hold). For the same time period as before, we note an increased CAR from 6.1% (SPY) to 7.3% (sector ETFs). Back to our carpool commute, Jason wasn’t really fazed by my improvement, as his 29 minutes were still a lot faster than my average of 48 minutes. I realized that he must be doing something differently that gave him more of an advantage. Then it began to dawn on me; typically I was picking a lane on the highway and stuck to it all the way to the exit. I found this to be relaxing, and it allowed me to shift my concentration to my favorite radio station. Of course, sometimes I might get slowed down by a truck, but that didn’t bother me. Jason, on the other hand, was changing lanes regularly. I couldn’t figure out exactly what caused him to do so, but I realized that it happened about once every three minutes. Had I finally uncovered the mystery? Excited to find out, it was my turn again to take the wheel. This time I was moved left and right in roughly the same manner as Jason, never getting held up for long. Sure enough, this shortened the drive. The analogous procedure to changing lanes accounts for the difference between passive (buy-and-hold) and active (dynamic positions and exposure) investment management. We achieve an even more meaningful comparison by applying changes to the portfolio positions that share the same characteristics as the strategy under evaluation. This provides a comparable exposure to the market forces (times when capital is invested) and simulates the advantage of “not getting stuck behind a truck” (holding on through a large drawdown). 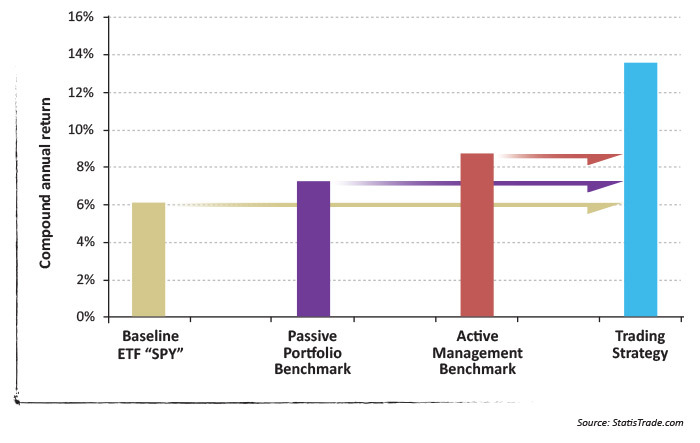 Applying this “Active Management Benchmark” to our example, we get an improved yardstick of 8.7% CAR. Having eliminated the differences due to trading vehicles and adjusted for the investment style, we are now ready to determine if the trading strategy has an edge above the new benchmark. With a CAR value of 13.6%, it is likely to produce outsized returns in the future. It is advantageous to select an active manager who has developed and consistently employs strategies with a proven track record of performance. As for my little challenge with Jason, unfortunately, the results weren’t nearly as uplifting. Changing my driving style did cut another six minutes from my commute time; however, my 42 minutes still didn’t come close to Jason’s 29. But is this really something to be unhappy about? Actually benchmarking with a properly adjusted yardstick helped me realize that Jason is really good at what he’s doing—giving me the confidence that he will handle the car in critical situations far better than I would. Furthermore, I can leave what I initially perceived as “hectic maneuvering” to him, while I sit back and relax—knowing his driving strategy gives me a consistent advantage. In similar fashion, it is advantageous to select an active manager who has developed and consistently employs strategies with a proven track record of performance. Understanding the nuances of “benchmarking”—and making sure it is an apples-to-apples comparison—will certainly help with that task.